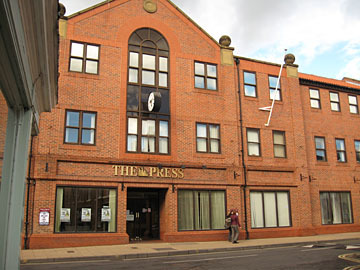 York’s newspaper, The Press, plans to move from its offices on Walmgate to smaller premises nearby. The proposed plans would see the demolition of the current premises, built in 1989, with the site redeveloped as student accommodation. The plans will be on display next Monday, 20 May, at the National Centre for Early Music between 1pm and 7.30pm. Many readers will remember when The Press (then the ‘Yorkshire Evening Press’) was based on Coney Street. When it moved from there to Walmgate that was seen as the end of an era, but also perhaps a necessary modernisation. Needed again, it seems. This proposed relocation is perhaps similar to Nestlé selling off the old factory site (Nestlé south) and having their modern production facilities built nearby? — which seems to have ensured their continued presence in the city. It has been difficult for newspapers since the internet provided so much news for free, from citizen journalists as well as qualified and trained people. It’s often said that ‘anyone can be a journalist’ now. Not really. We might occasionally replace a washer on a kitchen tap, doesn’t make us a plumber. An excellent article by Chris Titley on yorkmix.com, during industrial action by journalists, reminded us why we should value our local Press. Should we value the building constructed for them? A mere 24 years old? It seems wasteful to demolish it, as it did when the Peasholme Centre building (see ‘Homeless Heritage mapped) and the ‘Splash Palace‘ were demolished — both similarly ‘new’ buildings. But we’re surrounded by so many older buildings, listed as significant, with centuries of history. And student housing … ? Another time. Big subject. Why does York resort to building demolition so often? A 1989 building without a function already? It is in its own way quite attractive and fits the area well. The Civic Trust should be asking the Council serious questions.